Another simple recipe that you might like or put on your menu lists. So easy but delicious, I tried it and I really like it. In a bowl, mix the chicken with garlic, ginger, lemon grass, tamarind leaves, oil, salt and pepper; marinate and leave for about an hour. 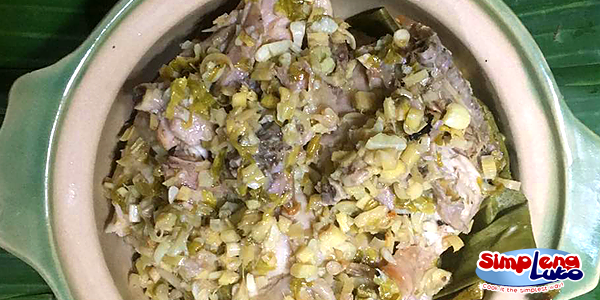 After an hour, place banana leaf into casserole, put the marinated chicken at the center and completely cover with remaining banana leaves. Simmer in low-medium fire for 30 minutes to 1hr (30min-1hr) until the chicken is tender.